Note 1: This entry is updated on February 10, 2010. Today’s edition of `Democracy Now!’ aired a segment on this subject. Palestinian relatives of some of those buried at Jerusalem’s Mamilla Cemetery are going to the United Nations to ask that the project be halted. Here is the link to the segment Democracy Now! . It adds some texture to the piece below firts published on January 24, 2010. There is a Colorado connection – Larry Mizel, Denver developer and now CEO of the Simon Wiesenthal Center in Los Angeles. Note 2: Updated again on March 22, 2010. Two new items – one from the Mamilla Campaign opposed to the continued construction of the `Museum of Tolerance’ on the site of the Mamilla Cemetery, the second from Haaretz of March 15, 2010 saying that despite the protests, that the construction of the museum will continue. The entry itself was not changed. 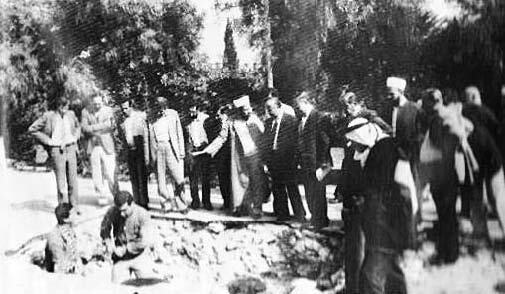 The shocked and appalled Jerusalemites and members of the Islamic Waqf gathering the scattered bones left by Israeli parking lot workers in Mamilla, the historic cemetery in the western section of Jerusalem (1967). A project in the works for nine years to construct what is formally called a `Museum of Tolerance’ in Jerusalem sponsored by the SimonWiesenthal Center in Los Angeles, has run into problems. According to the museum’s literature, the Jerusalem project seeks to promote `unity and respect’ among Jews and between people of all faiths’. Sounds promising at first, but when asked if the `tolerance’ the museum hopes to promote would include Palestinians, Rabbi Marvin Hier responded that the museum is `not about the experience of the Palestinian people; when they have a state, they’ll have their own museum’. Sounds less promising. Then the plot thickens. The project had been controversial from the outset as it was planned to be built on the grounds of the Mamilla Cemetery, at least 1000 years old, which includes the remains of Moslems who fought against the Crusaders in the 12th and 13th centuries, as well as those of Moslem scholars from the 15th century onwards. Some reports suggest the cemetery is even older, perhaps 1500 years and the remains of friends of the Prophet Mohamed are buried there. The museum authorities come up with a fountain of lame excuses as to why it’s not a `big deal’ to build their tolerant museum on the bones of moslem holy men and scholars. Sounds awful. but when asked if the tolerance’ to museum hopes to promote would include Palestinians, Rabbi Marvin Hier responded that the museum is `not about the experience of the Palestinian people; when they have a state, they’ll have their own museum’. In spite of this detailed history and a slew of related legal problems that have plagued completing the museum, the Wiesenthal Center has done everything in its power to forge ahead with constructing the project with strong support from Israeli government and Jerusalem municipality officials. Sounds downright intolerant. It does so even though the chief architect, Frank Gehry, whose credits include the Guggenheim Museum in Bilboa, Spain and the Disney Concert Hall in Los Angeles, has, disassociated himself from the project, leaving the future of the museum up in the air. The Simon Wiesenthal Center issued a press release stating that some scaled down version of the project would proceed all the same. Although most recently Gehry claims he withdrew over the financial aspects, it is likely that nine years of political opposition from Palestinians as well as a fair number of Israelis, were major factors in Gehry’s decision to pull out, one that has embarrassed the Wiesenthal Center and threatens to undermine the project entirely. Despite Palestinian and Islamic opposition to the project from the outset, Wiesenthal’s Rabbi Marvin Hier pressed on with the project. When the project was first announced in 2001, it triggered angry responses from Muslim leaders who warned that there was no way the museum could be built without dis-interring graves, but their concerns were ignored until 2006 when it was reported that dozens of skeletons had already been unearthed during early excavations. Israeli archeologists were hoping to secretly move the skeletons, many of which had been damaged, without alerting Muslim authorities. 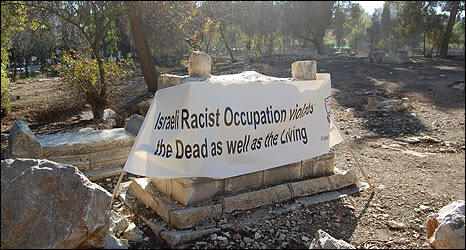 In 2008, the issue went before the Israeli Supreme Court which authorized the construction project. In response, Jerusalem’s mufti, Sheikh Mohammed Hussein, called the museum’s building ‘an act of aggression’ against the Muslim public. He added `how can a museum carrying the name of `tolerance’ be built on a graveyard. Rabbi Hier responded – giving a sense of what he means by `tolerance’ by dismissing Arab objections as cover for ‘a land grab by Islamic fundamentalists, who are in co-operation with Hamas’. Up until a few days ago, Jerusalem Mayor Nir Barkat supported the Mamilla site for the museum. He is quoted as having said `I don’t see any problem with the site…it’s a non-issue’. But in light of Gehry’s withdrawal even he is vascillating and now is hinting that perhaps another site for the museum would be better. Although Hier enjoyed past support of Arnold Swarzenegger and Ehud Olmert, he now appears to be increasingly isolated. It wasn’t only Moslem and Palestinian voices that protested against the project. Many Israeli and Jewish voices joined in, either with lukewarm support or downright opposition to the idea. They ranged across Israel’s political spectrum. Many Israeli scholars, cultural figures, Orthodox leaders including Knesset member Rabbi Meir Porush and some American rabbis have joined the opposition to the museum, along with a group of leading British architects who signed a petition condemning the proposed museum as a `blow to peaceful co-existence’. The Central Conference of American Rabbis, an umbrella group representing some 1500 Reform rabbis, urged the Wiesenthal Center to `find an alternative location to the three-acre site in downtown Western Jerusalem. Also opposing the project were Revner Rivkin, Likud speaker of the Knesset and former Deputy Mayor of Jerusalem, Meron Benvenisti who denounced the Museum of Tolerance as `so hallucinating, so irrelevant, so foreign, so megalomic’. Yad Vashem, the holocaust memorial museum added its opposition, arguing that Jerusalem did not need another museum. Even many mainstream Israelis are opposed. They question a museum conceived, financed and designed by Americans. Shimon Shamir, former Israeli ambassador to Egypt and Jordan, who now heads the Institute for Diplomacy and Regional Cooperation at Tel Aviv University said that he met with Gehry in Los Angeles in a bid to persuade him to withdraw. `I explained to him what a big mistake it was. I hope that it will never be built’. And as it turned out, there is a Colorado connection to Jerusalem’s Museum of Tolerance. As resistance to the project mounted Mizel, founder MDC Holding, once the largest builder of residential homes in the USA, intervened both in his capacity as chairman of the board of the Wiesenthal Foundation; a long time and dedicated Zionist, Mizel is also on the national board of the American-Israel Public Affairs Committee (AIPAC) and has long been one of the more influential power brokers in the Republican Party both here in Colorado and nationally. Mizel also has long had the reputation of a five-star fundraiser both for Republican and Zionist causes. Also on the board of the Wiesenthal Center and a vice president of AIPAC, is Mizel’s long time friend, legal advisor, and political animal extraordinaire, Norm Brownstein. Mizel is `into’ museums. There is one in his name established here in Denver, the Mizel Museum . More recently he spearheaded, and largely funded a `project’ of the Mizel Museum called `The CELL’ – The Center for Empowered Living and Learning, a bizarre (and frankly awful) multi-media anti-terrorism museum in the heart of Denver. So the Museum for Tolerance in Jerusalem is right up his alley so to speak. In fact, it is impossible for Larry Mizel not to be in the middle of this project, both on the fundraising end of things as well as in lobbying for support for the Museum of Tolerance both in Israel and the United States. For example, on at least one occasion when the project ran into trouble, he called Prime Minister Ehud Olmert to lobby to keep the project alive. More recently, last November, in part to build more support for the project, Mizel arranged a major appearance in Denver for Jerusalem mayor Nir Barkat, a strong supporter of the project. In November, Barkat spoke at an event at the University of Denver sponsored by the state’s governor, Bill Ritter (D) and University of Denver Chancellor Robert Coombe. Barkat’s Denver visit was funded in part by the Mizel Family Foundation. It wouldn’t be surprising if Mizel organized some fundraising meetings as well for Barkat. This a far cry from how things started out in 2001 with 10 contributors pledging $10 million each and a national campaign to raise the rest of the money looking quite promising. Some lost their money in the recent financial crisis and with it their contribution. Others, it appears, are now shying away as well. It does not seem that the Wiesenthal Center has gotten the message: for many reasons, building the Museum of Tolerance on a Muslim cemetery is an awful idea, let us say it plainly: it is profoundly racist and what makes it worse is Rabbi Hier’s obliviousness and callousness to the protests. The best thing the Center could do – for all concerned – is to let it die on the vine, cut their losses and move on… And instead of building museums `celebrating’ tolerance, to practice it instead, by joining those calling for an end to the Israeli Occupation. But it will be a cold day in hell, as they say, before the Simon Wiesenthal Center even considers such a prospect. ← Who Gave Bibi Permission to Own Palestine? Where Do we Start?